Sinuglaw is a famous Davao food. It originated from two different Filipino culinary processes; the “sugba” means to grill and “kinilaw” refers to raw fish cooked in vinegar. 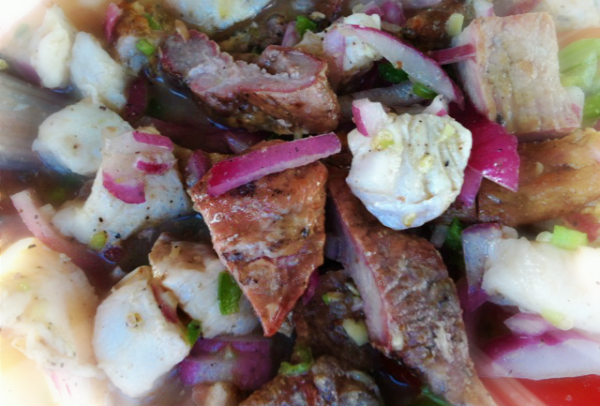 It is a unique fare of usual grilled pork liempo and the traditional Davao Kinilaw made from the cubed meat of the Yellowfin Tuna. The contrast of two dishes makes it very explosive. Tangy yet sumptuous, spicy and creamy, savory and moist. Sinuglaw is a must-try when you visit the Philippines. Sinuglaw is often eaten as an appetizer as well as a pulutan. Match sinuglaw with an iced-cold beer and you will see for yourself why this dish has captured the hearts of many. 5. Grill the pork belly, cut into cubes then toss it into the kinilaw mixture.